Nobody does Halloween better than Mexico. Dia de los Muertos sprang up as a combination of the Catholic All Saints’ Day and All Souls’ Day with Aztec traditions that make light of death while celebrating the lives of fallen loved ones. The celebration, which spans the first two days of November, involves assembling shrines (or ofrendas) full of pictures of the departed along with some of their favorite things in life, such as candy or flowers. 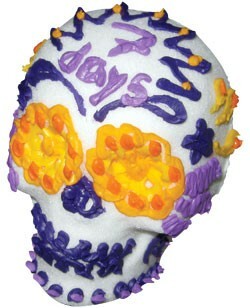 An arrangement of marigolds and sugar skulls, called calaveras or calaveritos, completes the picture. The cemeteries of the Green Mountains may not fill with celebrants on November 1, but we can enjoy bones of our own. Li Ling Young, a Burlington mother and employee at Vermont Energy Investment Corporation, recently began marketing a line of sweet skulls to other fans of Mexican art and culture. A Los Angeles native, Young says she has always found Dia de los Muertos “fun and exciting and like nothing we have in the U.S.” Though she has long made the treats for her kids’ school, Young just began advertising the candies on Front Porch Forum. Young’s sugar-and- meringue-powder creations are available undecorated for $5 to $8, depending on size. For Halloween parties, she offers packages with plain skulls and decoration fixings. But Young says most customers request she use her own artistry to give the dead some pizzazz. To order your own, write to Young at liling@caa.columbia.edu.